This has been Scott and my go to dinner for the last few weeks, especially while he was watching his weight for Golden Gloves and needed to be careful of his sodium intake. Brussel Spouts and walnuts tossed in olive oil, lemon juice, a splash of maple syrup, and pepper, roasted in the oven uncovered for 40 minutes. Served over brown rice, topped with chevre, alongside a baked sweet potato. Not only is this meal amazing to taste, and simple to make, it also has a complete amino acid profile and no added sodium. 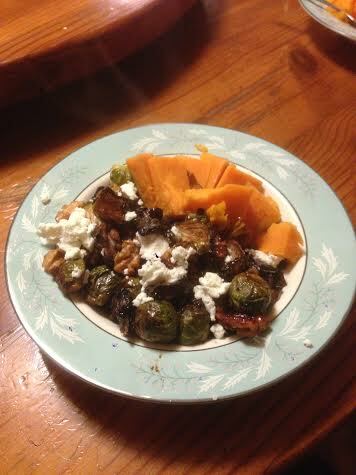 This entry was posted on January 22, 2014 by Chef Jill in Nutrition, Recipes and tagged Brussel Sprouts, Dinner, Goat Cheese, low sodium meals, Sweet Potato, Vegetables.